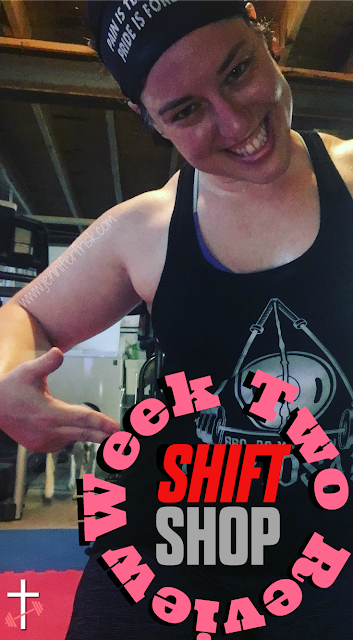 Last Monday I told you about my first taste of Shift Shop, and I just couldn't get enough! I was feeling fantastic and had extra energy in spades! I was loving the meal plan and the fast results that I was already seeing. I couldn't believe how alive I felt! Ladies, you know "that week"? The one where you are dragging and tired? The one where all of a sudden chocolate seems like the most important thing in the world? The one where all of your energy and all of your strength just seem drained out of you, and the simplest task seems to require mammoth brain power? Yeah, well, that was last week for me. Couple that with a stricter meal plan and longer workouts, and yeah, I struggled. 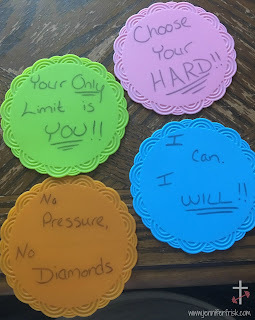 Every time I wanted to quit, I looked down at my markers and repeated whichever one I happened to land on until I found the strength to keep going. The green marker? Yeah, it's already fading as it was the one I seemed to need most. The meal plan for the week changed slightly as well. I was no longer allowed beans with my meals, AND I lost a yellow container each day. I also lost a purple container and gained a red container. My yellow containers were pretty much used for sweet and white potatoes each day. But - outside of the chocolate cravings - I still didn't find it hard to follow. I was never hungry, and it was still pretty easy to eat according to plan. Oh, and I lost another pound this last week. One more week, and I'm eagerly anticipating the final results! Do YOU need a jumpstart? Do YOU need a shift? Fill out the form below, and I'll reach out!